The past year has been a busy one around the BarbecueBible.com offices. Between the upcoming release of Season 2 of Project Smoke in just a few short weeks, and the Project Smoke book hitting bookstores this week, we haven’t had much free time on our hands. Now that we have a moment to relax, we want to celebrate the release of Project Smoke in style! 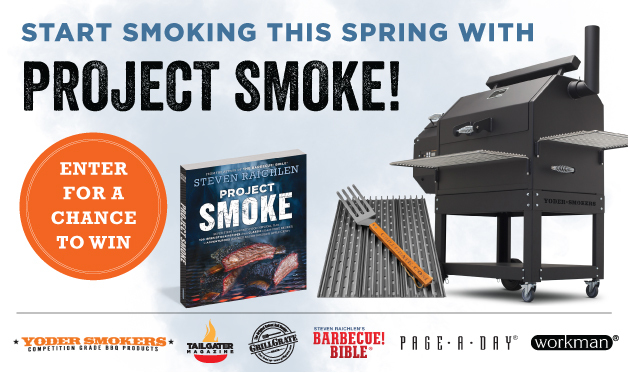 We’ve teamed up with two sponsors of the TV show, Yoder Smokers and GrillGrate, to bring one winner an amazing Project Smoke Prize Pack—enter for a chance to win below. And because we want all of you to celebrate with us, Tailgater Magazine has come on board and will give every entrant a free digital issue—see the form below! NO PURCHASE NECESSARY. Open to US residents of the 48 Continental United States, age 18 years as of June 19, 2016. Sweepstakes begins at 12:00 a.m. Eastern Time (ET) on 5/9/2016 and ends at 11:59 p.m. ET on 6/19/2016. Click here for official rules. Void where prohibited. Click here to learn more about the Yoder YS640 Pellet Grill. Click here to find out more about all the grills GrillGrate tools can be used on. Click here for your free digital issue of Tailgater Magazine.